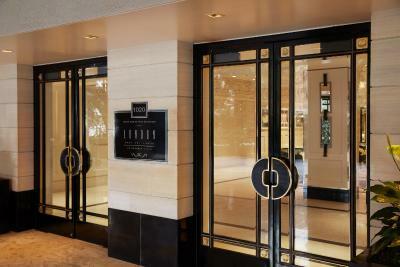 Lock in a great price for The London West Hollywood at Beverly Hills – rated 8.9 by recent guests! Great location and amazingly friendly and helpful staff. Beautiful, large rooms. Staff very friendly and accommodating. Great light and good location. Would def stay here again! Lovely setting. Perfect city view. Friendly staff. 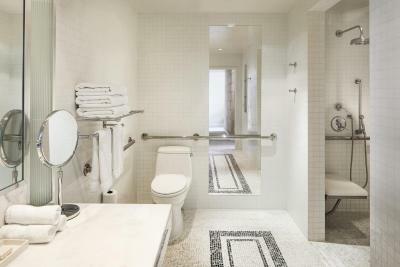 Modern rooms with big classic bathrooms. The breakfast that was included with the room was awesome! It was a great variety and was delicious. My wife order off the breakfast menu and she really liked his food as well. Our waiter was very attentive and kind as well. Our room was HUGE! We got a London Suite and were expecting a "normal" size room but to our surprise the room was way bigger then expected. The restroom was ginormous and we loved it!!! 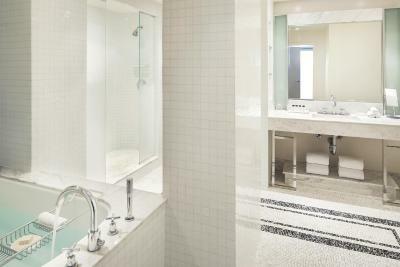 The bathroom of the suite I stayed in was very clean and nice. It was very different to other hotel bathrooms I've seen. The suite itself was quite big. Upon arrival, we were also greeted by very friendly staff at the reception. We had some clogging issues in the shower and maintenance came to fix it immediately after I called, and cleaned up the shower before he left too. 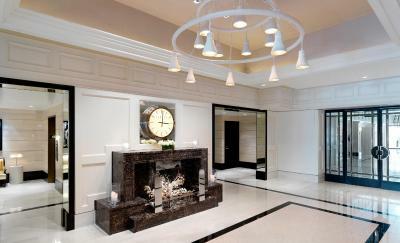 The rooms are amazing, every room is a suite and the bathrooms are also very spacious. Beds are also very comfortable. Everything! 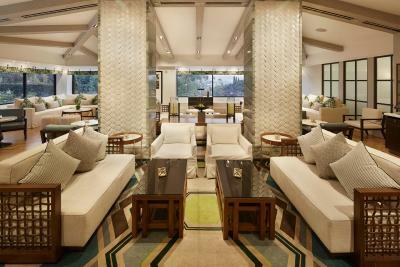 Great design, vibe, very good breakfast, location is perfect. Nice terrace with a pool. Got an upgrade and champagne because it was our honeymoon, very nice touch!! Will come back for sure. The facilities and swimming pool was great. Very friendly staff. 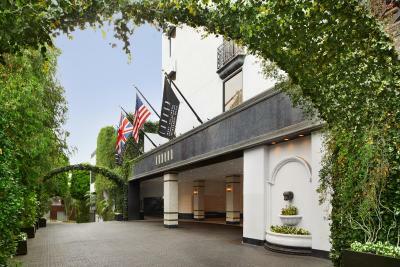 The London West Hollywood at Beverly Hills This rating is a reflection of how the property compares to the industry standard when it comes to price, facilities and services available. It's based on a self-evaluation by the property. Use this rating to help choose your stay! 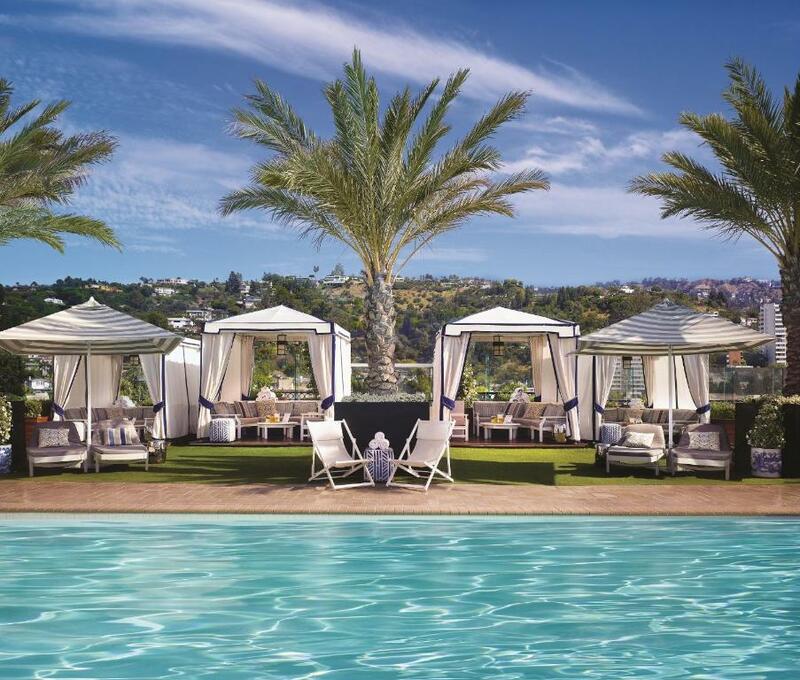 One of our top picks in Los Angeles.Steps from Beverly Hills and Rodeo Drive shopping, this boutique West Hollywood hotel features a rooftop deck with cabanas and a restaurant that serves a daily European continental breakfast buffet for free. 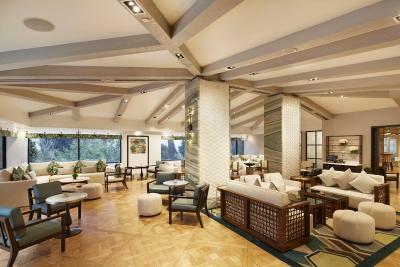 Guests can also enjoy the fitness centre and multiple dining options on-site. 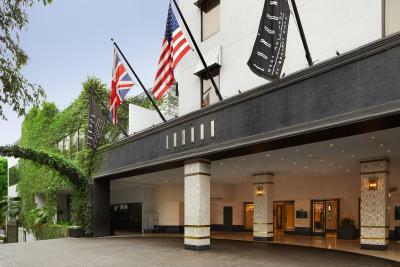 Featuring free WiFi, each air-conditioned suite at The London West Hollywood includes a flat-screen TV and an iPod docking station. 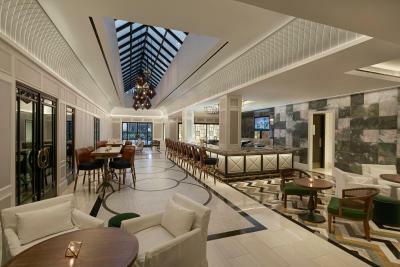 Standard suites include an open floor plan with plenty of living space and the hotel also offers 1 to 3-bedroom specialty suites. 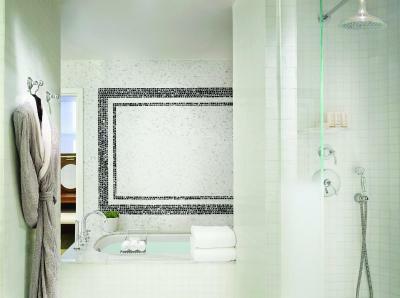 All suites provide mirrored closets and a vanity, a walk-in shower with 2 shower heads and a soak tub. Most suites also include a balcony with views. 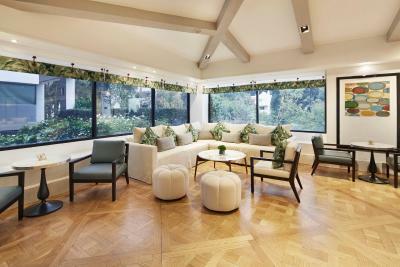 Many larger suites also boast completely separate seating areas with wet bars and walk-in closets. 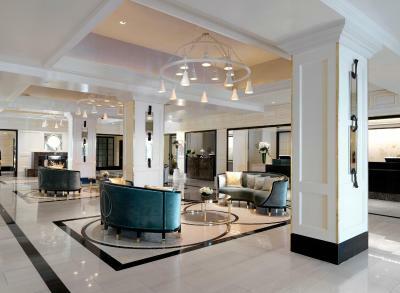 The property's complimentary breakfast is a European-style continental breakfast buffet. 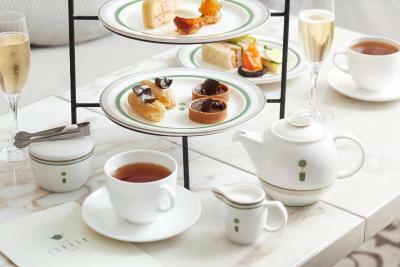 It includes pastries, bagels & lox, cheeses, charcuterie, yogurt parfaits, fresh juices, coffee & tea, cereals, and other seasonal varieties. 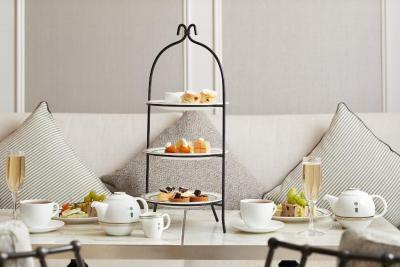 Guests of The London can choose unique dining options. 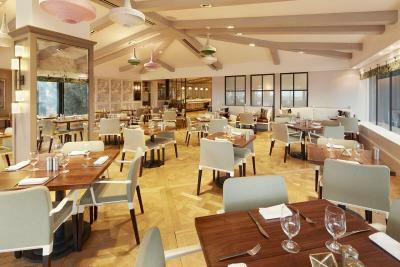 Boxwood at the London West Hollywood features California cuisine with a menu that includes seasonal, fresh local produce and small plates. 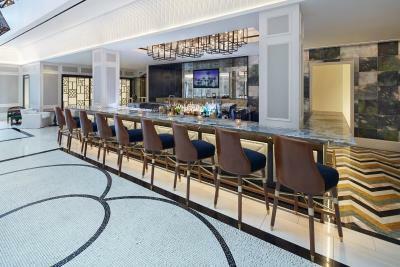 The restaurant includes an elegant cocktail bar and an extensive wine list. 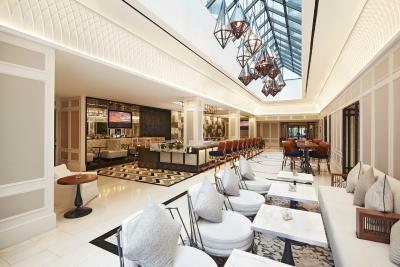 The Rooftop features outdoor dining and a seasonal menu and serves lunch, dinner and brunch. 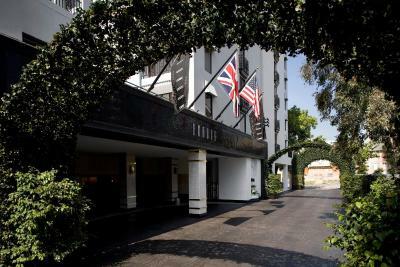 The London West Hollywood also provides guests with a fitness centre. The 24-hour facilities include cardio equipment, Life Fitness machines and an outdoor yoga area. 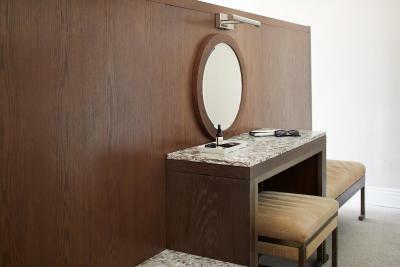 Guests can also visit the on-site salon for hair styling, nail, & makeup services. 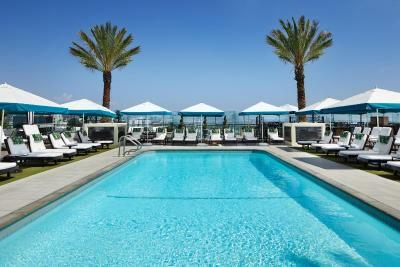 Cabanas can be rented at the pool area and are equipped with minibars. 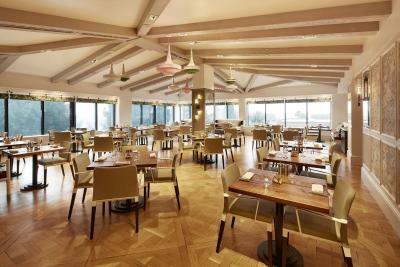 Guests can order from the property bar as well. Beverly Hills and the Beverly Center Mall are 4 minutes away by car. 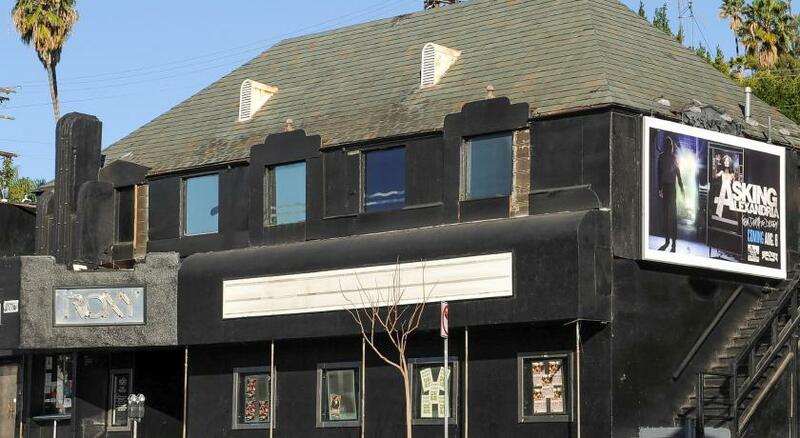 The Hollywood Walk of Fame and Melrose Avenue shopping are just 10 minutes away while driving. 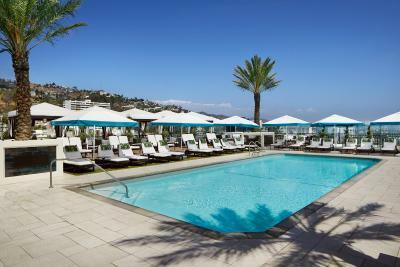 West Hollywood is a great choice for travelers interested in nightlife, restaurants, design and clothes shopping. 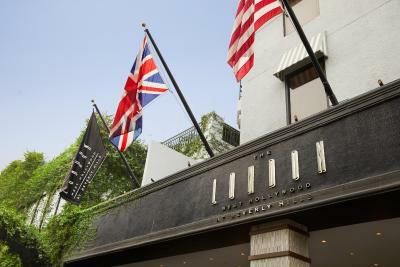 When would you like to stay at The London West Hollywood at Beverly Hills? 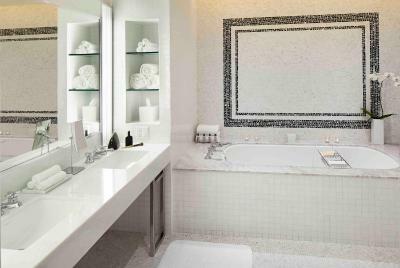 This spacious air-conditioned suite features a flat-screen cable TV with satellite channels, an iPod docking station, a sofa, a walk-in closet with a vanity, a walk in shower with 2-shower heads and a soak tub. Includes a balcony with a view. On floors 5 to 8, this spacious air-conditioned suite features a flat-screen cable TV with satellite channels, an iPod docking station, a sofa, a walk-in closet with a vanity, a walk-in shower with 2 showerheads and a soak tub. Features a city view. Max occupancy of room is 2 adults. This spacious air-conditioned suite features a flat-screen cable TV with satellite channels, an iPod docking station, a sofa, a walk-in closet with a vanity, a walk-in shower with 2 showerheads and a soak tub. 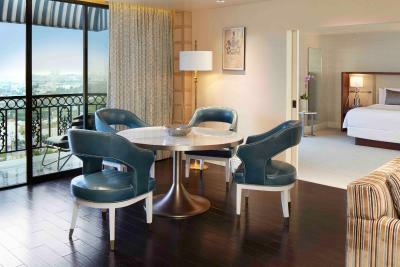 This suite has the most preferred city view in the hotel. 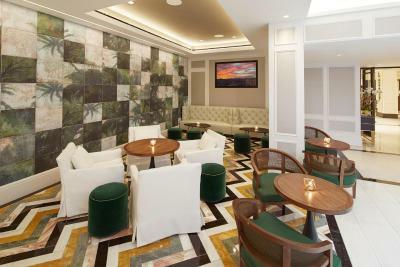 Offering free Wi-Fi, these spacious suites feature 2 expansive outdoor terraces and incomparable views of the Hollywood Hills or the Los Angeles skyline. They include a flat-screen cable satellite TV, an iPod docking station, an oversized work desk and a custom coffee machine. The private bathrooms have free toiletries and guest bathrobes. Free international calls to London are provided. 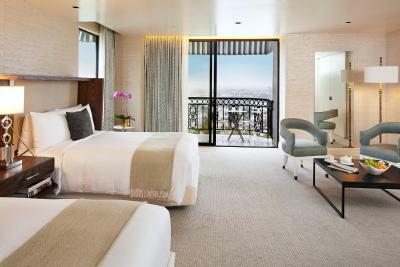 Also known as the Royal Vista Suites, these spacious 9th floor suites feature 2 expansive outdoor terraces and incomparable views of the Hollywood Hills or the Los Angeles skyline. 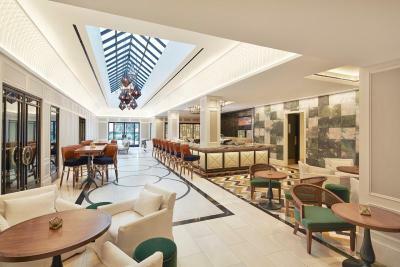 They include a flat-screen cable satellite TV, an iPod docking station, an oversize work desk and a custom coffee machine. The private bathrooms have free toiletries and guest bathrobes. Free international calls to London are provided. Please note: Maximum occupancy is 4 guests. 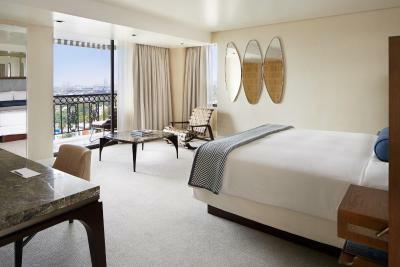 Also known as the Royal Vista Suites, these spacious suites are located on the 9th floor. 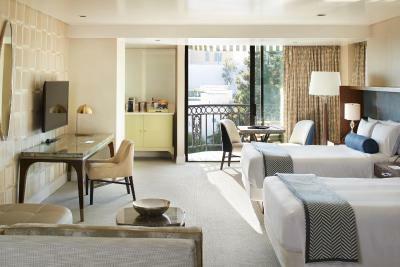 They offer a king bedroom and a double bedroom with views of the Los Angeles and Beverly Hills skyline. 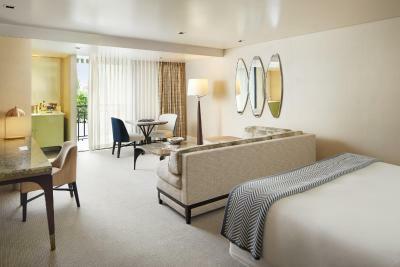 Suite includes a dining room, 3 balconies and 2 bathrooms with a walk-in shower and tub. Living area includes a sofa, a flat-screen cable satellite TV, a dining table and a large work desk. Free international calls to London are provided. 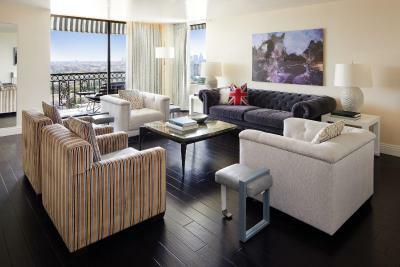 Also known as the Royal Vista Suites, these suites are located on the 9th floor, this spacious top floor suite offers free WiFi and incomparable views of the Los Angeles or Hollywood Hills skyline. 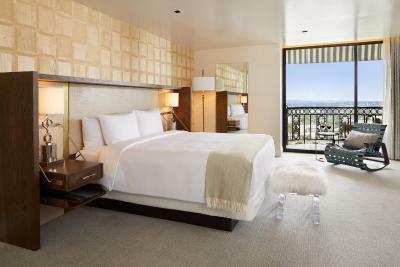 Decorated in soothing sand and cream tones, these spacious suites offer free Wi-Fi and floor-to-ceiling windows. They include a kitchenette, an oversized work desk, free breakfast and free one-way airport service. 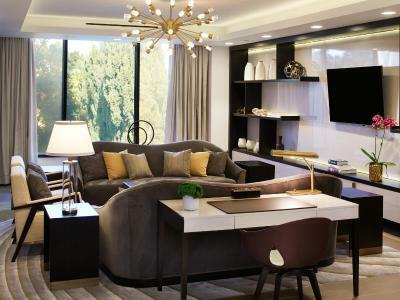 One and Two Bedroom Suites can be combined to create a Three Bedroom Suite. 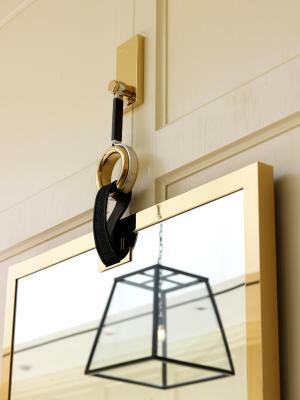 If a guest wants to book a Three Bedroom Suite by combining two suites they need to contact the hotel in advance. Featuring free Wi-Fi and decorated in blue and cream tones, these spacious air-conditioned suites feature 2 living rooms, a flat-screen satellite TV and 1.5 bathrooms complete with guest robes and free toiletries. 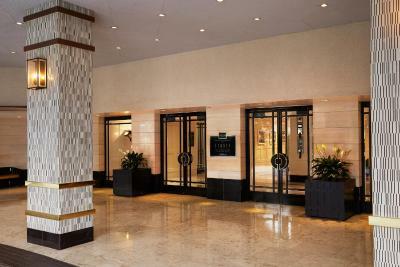 A complimentary continental breakfast is offered each morning and free international calls to London are provided. 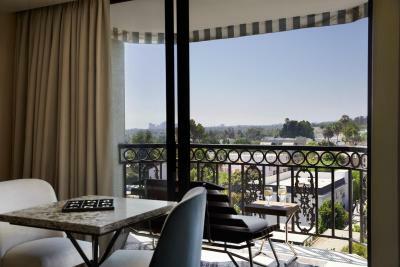 This double room features a balcony with views of Los Angeles and the hotel garden terrace. 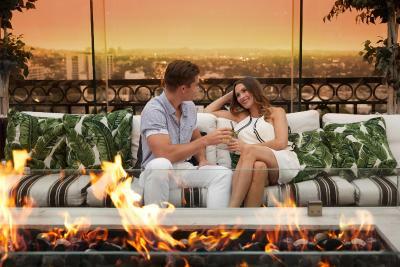 House Rules The London West Hollywood at Beverly Hills takes special requests – add in the next step! 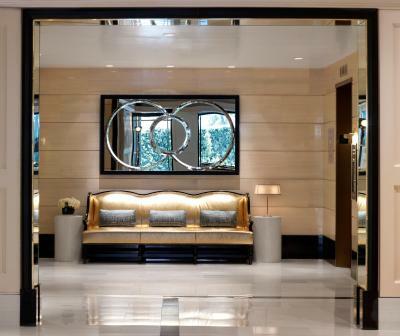 The London West Hollywood at Beverly Hills accepts these cards and reserves the right to temporarily hold an amount prior to arrival. Pet policy is for dogs only. Dog must be 30 lbs or less. No other type of animals are allowed. The Sun Deck may be closed on some dates due to private events. - House car service within 2 mi from 15:00 until 23:00. 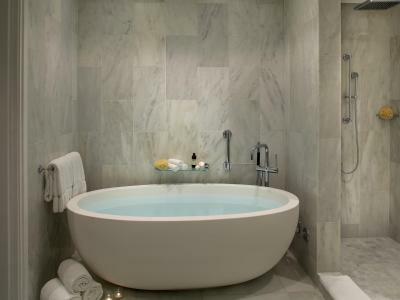 Fabulous hotel rooms, bathrooms and beds. Would recommend and love the location. Maybe switch up the buffet. 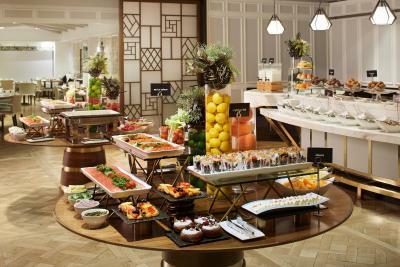 3 days and same buffet items every day. I think it’s over priced !